How you got involved with us – When I was looking at colleges I was really impressed with MC because of the Mountain Challenge program, so I applied for the fellowship scholarship (the first year there was a fellow) and ended up climbing the tower during the interview. I ended up getting the presidential scholarship instead, but was put into Bruce’s expedition orientation group so my first experience as an MC student was backpacking in the park for 3 or 4 days. I knew after those two experiences that I wanted to be on staff so I started volunteering my very first semester and then became a staff member. 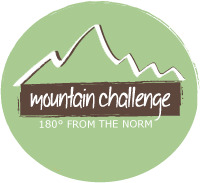 Most meaningful Mountain Challenge experience – There are a lot: Costa Rica, expedition, adventure races, meeting lifelong friends, etc; but two stand out the most and they are very different. I was helping to facilitate a freshman orientation on the tower (I think I was a sophomore, but I could have been a junior) and it started to rain, but not heavy. The freshman that I was working with was belaying and started to have a seizure. It was the first time that I’d had an incident like that while working a course. Bruce was there in a second and helped me manage the situation so that everyone was safe, and I don’t even think the other participants even knew that anything was really off. This taught me a lot about grace under fire and how to handle a high stress situation calmly and effectively. How it influenced your career – Mountain Challenge has influenced my career in both big and little ways. My junior year of college I started working the Cornerstone contract that Mountain Challenge had, taking clients from the local substance abuse treatment center out onto the ropes course 2-3 times a week. That’s where I was first introduced the idea of working with clients with addictions issues. I ended up going to graduate school and specializing in addictions medicine. The little ways are more subtle. I value connecting with people and making every interaction meaningful and helpful with the idea always in the back of my mind that one person at a time the world can be improved. I’ve had a lot of jobs that I left because the company didn’t have good Mojo and I didn’t feel connected with the mission of the company. I spent a long time looking for, and finally found, a job that helps me Feed the Rat on a regular basis, but also supports me having a balanced, healthy life and I’m able to experience Flow. A funny story – Freshman year, for April Fools, Liz Fishburn (now Liz Fishburn Miles) and I convinced Dana Davidson that Mountain Challenge was adopting a pet cow and had him show up at Crawford house really early in the morning so we could “go pick up the cow”, except of course there was no cow and we were tucked up sleeping in our beds.